Very few people are comfortable buying something as expensive as a car without putting it through its paces first to make sure it can handle exactly the type of driving required. But test driving on a highway doesn’t reveal much useful information if the car is to be driven like a taxi in New York City. A proper test drive that accurately simulates the intended driving conditions is necessary to determine whether the car meets the needs of the driver. No one would want to be stuck with 48 monthly payments on a new car that doesn’t perform where it’s needed most. And no one responsible for a processing line would want to be stuck with a drying system that doesn’t dry to specifications – but it happens more often than one might think. Buying a dryer for sludge, snack chips, cereal or plastic pellets or another product for potentially hundreds of thousands of dollars may seem far more risky than buying a car. Though few engineers would question the need to test a dryer before signing the purchase order, many conduct testing that, on the surface, seems useful but in reality, fails to verify whether their new dryer will actually work as hoped and intended. Many dryer manufacturers avoid investing or refuse to invest in a dedicated space for a testing laboratory that is fully stocked with full, pilot-sized process equipment. Their testing is restricted to bench top dryers. Testing the product in a fluid bed bench top dryer, for example, yields information about the fluidization properties of the material and the residence time needed to dry to the required specification. But the bench top dryer cannot provide any insight about the flow properties of the material for proper sizing of the dryer. Will the material stick to the infeed and cause blockages? Will there be fine particles entrained in the airstream? With a bench top dryer test, there’s no way to know. Getting this information requires testing in a continuous process that reveals how the material moves from the infeed through the drying section to the discharge. It requires a pilot-sized fluid bed dryer. One customer was ready to order a fluid bed dryer after lab bench top testing. Our test in a full-sized dryer with continuous operation revealed nearly 25 percent of the product would be lost as fine particles in the airstream. This test allowed us to catch the error early and design a new system featuring our integral baghouse dust collector above the drying section. This captures the fine particles and returns them to the process but the disastrous product loss would not have been caught by bench top testing. While testing on a bench top dryer surely cannot simulate actual process conditions accurately, it is not the only part of the testing process that often fails to mimic reality. The product sample must be representative of the product to be processed, otherwise we’re designing a drying system for apples that’s really going to process oranges. The sample’s moisture content, particle size distribution, viscosity, bulk density and other factors need to match the actual product for any testing to be valid. If the moisture content of the sample, for example, is less than the actual moisture content of the material to be dried then the dryer, once scaled and installed, would lack the drying capacity needed to meet the moisture specification. Conversely, too much moisture in the sample would result in designing a dryer with excess capacity at extra cost. To help protect the integrity of the product to be tested, samples may be taken directly from the process, sealed in plastic and delivered to the test lab or sent overnight. Matching the sample to the actual product may seem like an obvious requirement but there are occasions where it isn’t the case. One customer needed to dry a product incoming at three percent moisture to less than one percent moisture at 70,000 pounds/hour. The product sample was tested in our in-house testing laboratory, and the fluid bed dryer was designed, manufactured and installed. Unfortunately, the actual product entering the dryer at the infeed ranged to five percent moisture, not three percent. This meant an additional 1,500 pounds/hour of moisture had to be evaporated and as a result the customer had to operate at reduced capacity. In cases where conditions in the plant simply cannot match conditions in the testing laboratory, we send a full, pilot-sized fluid bed dryer to the facility. Food products from an extruder, for example, need to be tested immediately before they harden. Since the particle size of the material determines the air velocity to be used to fluidize the material without it becoming entrained in the exhaust airstream, as well as the dryer size and type of ancillary equipment needed, the impact and importance of understanding the particle size distribution of the material cannot be understated. The percentage of fine particles less than 100 mesh (150 micron) needs to be verified at the outset because this determines the type of dryer that may be specified. In a conventional fluid bed dryer using a cyclone, these fine particles would likely become entrained in the airstream, lost as waste and exhausted to the environment. 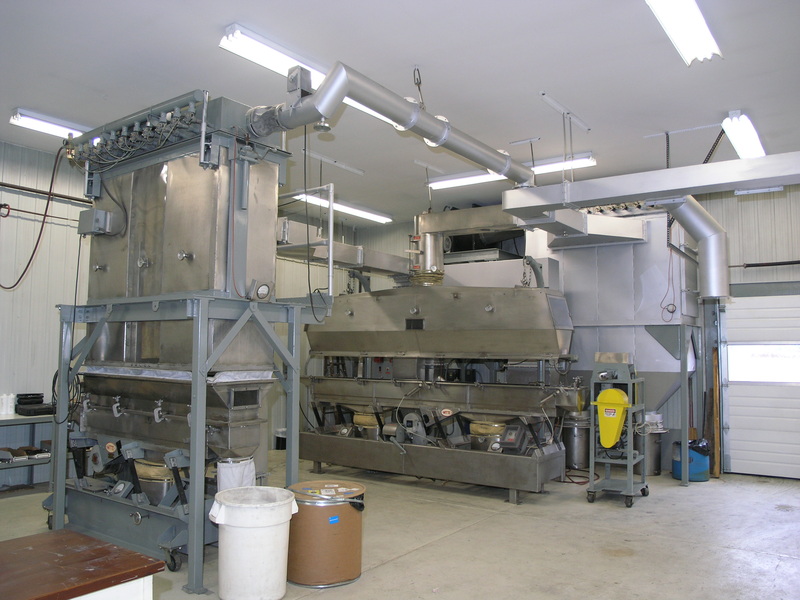 Using the integral baghouse dust collector design described above, however, allows fine particles as small as five microns to be captured over the drying section and returned to the process with virtually zero product lost as waste or to the environment. Though this can be tested with common particle analyzers, many processors do not know the particle size distribution of their products. One customer with very fine particles didn’t know that six percent of the product was being lost as waste – for years. By testing the particle size distribution, we were able to confirm that the fluid bed drying system with the integral baghouse dust collector was required. Today, the fines are recovered as product. The key is to know the properties of the product to be dried. These properties are most effectively determined by conducting a variety of tests on a representative sample using a full, pilot-sized fluid bed dryer under controlled conditions that simulate actual operating conditions. Further testing on the finished drying system to verify it performs as specified is also recommended and often overlooked. Lastly, before investing in a drying system, check for two warranties: one for workmanship and a second, process warranty guaranteeing the system’s performance. If the process warranty is offered without full, pilot-size testing then consider other suppliers. Larry Stoma is design engineer at The Witte Co., Washington, NJ. For more information, call 908-689-6500, lstoma@witte.com or see www.witte.com.